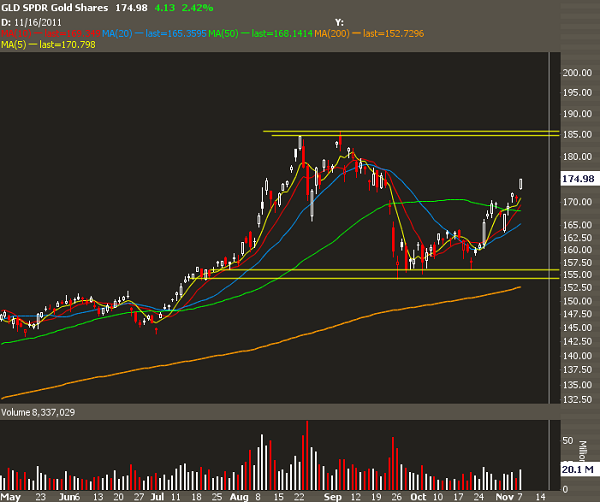 $GLD has been a wild ride over the past few months. But it has been a mean-reverting one. Non-directional income trades have worked fairly well here, provided that you have gone far out enough in time to mitigate the gamma risk-- see more about understanding the greeks here. Gold has acted as a risk-off theme, especially starting in August when it went parabolic on the Eurozone news (my thoughts on that here). Since then it had a pretty nasty correction, slowly drifted for a while, then caught a bid and a breakout. Either way, there are clear support and resistance levels to deal with, so an income trade could be a good bet here. Now many newer traders may ask why take a trade that only offers a small amount of reward relative to your risk? The answer lies in the fact that you have a very wide area of profitability. 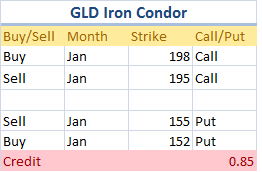 Provided $GLD can stay above 155 and under 195 then you will end up with a profitable trade. Because the trade is in January options, the time decay (theta) will take a while to manifest itself. Think of the trade more like a "slow cooker" than a "stir fry" of directional trades. However, this is not a set and forget kind of trade. You need to account for how you will manage your directional risk (deltas) as well as what to do if a multi standard deviation occurs in a short amount of time. This is why you need to fully understand the real risks in this trade. We'll be looking to deploy this or something similar in the Model IWO portfolio. We go beyond ideas and focus on position sizing, risk management, and adjusting a position to cut risk and enhance returns. You can learn more here.